Has the Age of the Electric Car begun? There are more and more electric automobiles on the road today but no one has noticed. A funny thing about industrial or technological ages is they usually begin well before we notice. It was on January 29, 1886 when Carl Benz filed for a patent on his three-wheeled combustion engine motorcar. At the same time Gottlieb Daimler was creating the first four-wheeled automobile fueled with petrol. 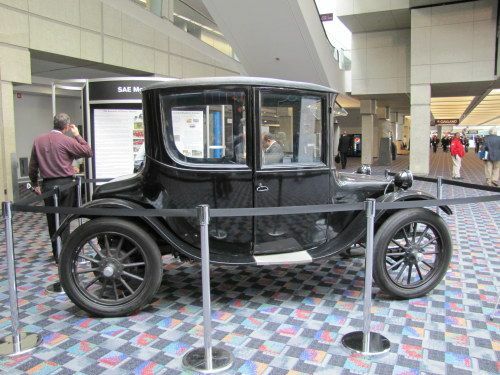 Today we recognize those efforts as the dawn of the Age of the Combustion Engine Auto, but actually at that time electric motorcars were somewhat more common. Electric cars had been around since the 1830’s and remarkably ran initially on non-rechargeable electric cells. As batteries improved and became reusable, more and more electric cars were tooling about the cities of America and Europe – mind you they were toys for the rich in those days. By the late 1890’s electric taxis plied the streets of New York and no one would have guessed the age of the combustion engine had already begun. It wasn’t until America built better roads demanding a longer-range vehicle and Henry Ford created the assembly line that the combustion engine began getting the upper hand. That was followed by the discovery of oil in Texas, greatly reducing the cost of gasoline. In 1912 the cost of an electric roadster was $1,750 while an early Ford was only $650. The Age of the Electric Automobile has already begun, but historians won’t see it until years have passed. Was it when California had its ill-fated experiment with electric cars in the 1990’s? Was it when Tesla rolled out their first prototype in July of 2006? • The Chevrolet Volt won Car of the Year at NAIAS this year. • Toyota made the Prius nameplate into its own brand, announcing the coming release of several more members of the Prius family, including a plug-in Prius. • The Nissan Leaf was released last fall. • Electric Mini-Coopers have been in field tests for nearly a year. • Volvo announced last year the C300 would be the model designated as their first electric conversion. • Tesla and Toyota have announced a partnership to produce an electric Rav-4. • Ford plans the release of the electric Focus next year. • Oil prices are approaching $100 a barrel. Increased demand from Asia will continue inflationary pressure on oil prices indefinitely. It took from 1886 to 1912 to realize the Age of the Combustion Engine had begun, but why should we wait until 2031 to announce the Age of the Electric Auto? Whether or not you agree, you cannot deny change is in the air and on the road. Image is taken by a Torque News reporter Frank Sherosky at 2010 SAE World congress in Detroit.